Choose your favorite Christian scripture magnet from popular magnets, including Bible verses from the Old Testament and the New Testament. FREE PRIORITY SHIPPING on orders of $75 or more! Use THIS PAGE to quickly browse through the selections available. TO ORDER go to the Shopping Cart. It is simply not possible to display on your screen the quality of resolution on the actual items. 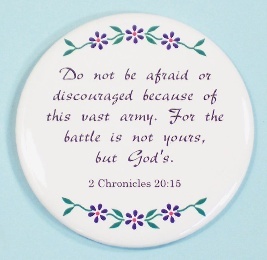 These Christian refrigerator magnets contain a variety of popular scripture verses on different biblical themes. Give a gift that will be a special favorite for years to come. All these refrigerator magnets are very powerful. They will hold thicker and heavier materials on your refrigerator. These magnets are made from sturdy metal components with clear mylar plastic protecting the artwork. For more information on the Bible versions we use or image quality refer to our FAQ page. These images may appear larger or smaller on your screen or printer, depending on your browser, your monitor size, and your control panel settings. The verses are not in absolute Biblical order within the Old Testament and New Testament categories.